It is already common knowledge that individual investors do not usually have the necessary resources and abilities to properly research an investment opportunity. As a result, most investors pick their illusory “winners” by making a superficial analysis and research that leads to poor performance on aggregate. Since stock returns aren’t usually symmetrically distributed and index returns are more affected by a few outlier stocks (i.e. the FAANG stocks dominating and driving S&P 500 Index’s returns in recent years), more than 50% of the constituents of the Standard and Poor’s 500 Index underperform the benchmark. Hence, if you randomly pick a stock, there is more than 50% chance that you’d fail to beat the market. At the same time, the 30 most favored S&P 500 stocks by the hedge funds monitored by Insider Monkey generated a return of 15.1% over the last 12 months (vs. 5.6% gain for SPY), with 53% of these stocks outperforming the benchmark. Of course, hedge funds do make wrong bets on some occasions and these get disproportionately publicized on financial media, but piggybacking their moves can beat the broader market on average. That’s why we are going to go over recent hedge fund activity in Gilead Sciences, Inc. (NASDAQ:GILD), one of the Top 75 Healthcare Dividend Stocks To Invest In. The smart money continues to become less confident in Gilead, as hedge fund ownership of the stock fell for the fifth time in the last six quarters. Formerly one of hedge funds’ favorite stocks, Gilead has fallen from grace, coming nowhere close to ranking among the 30 Most Popular Stocks Among Hedge Funds, which it would’ve done comfortably three years ago. It did fare better in the case of the 20 Dividend Stocks That Billionaires Are Piling On, ranking 9th. Gilead first started paying out a dividend back in 2015, with its yield doubling since then. If you’d ask most market participants, hedge funds are seen as underperforming, outdated investment vehicles of yesteryear. While there are more than 8,000 funds in operation at present, we choose to focus on the masters of this club, approximately 700 funds. Most estimates calculate that this group of people shepherd the majority of all hedge funds’ total asset base, and by tracking their finest stock picks, Insider Monkey has deciphered numerous investment strategies that have historically exceeded the broader indices. Insider Monkey’s flagship hedge fund strategy outstripped the S&P 500 index by 6 percentage points per year since its inception in May 2014 through early November 2018. We were able to generate large returns even by identifying short candidates. Our portfolio of short stocks lost 26.1% since February 2017 even though the market was up nearly 19% during the same period. We just shared a list of 11 short targets in our latest quarterly update. What have hedge funds been doing with Gilead Sciences, Inc. (NASDAQ:GILD)? Heading into the fourth quarter of 2018, a total of 56 of the hedge funds tracked by Insider Monkey were long this stock, a 2% dip from one quarter earlier. 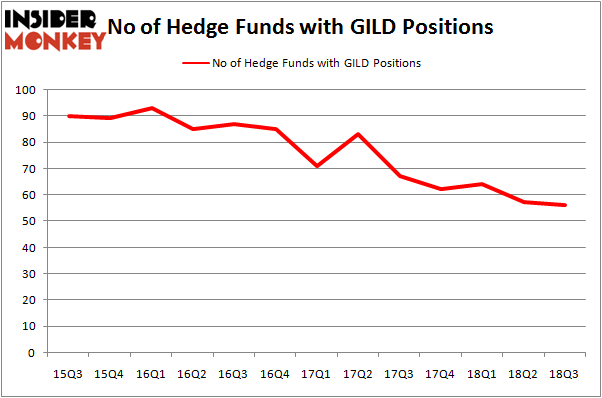 By comparison, 62 hedge funds held shares or bullish call options in GILD heading into this year. With hedgies’ capital changing hands, there exists a few noteworthy hedge fund managers who were boosting their holdings meaningfully (or already accumulated large positions). Of the funds tracked by Insider Monkey, AQR Capital Management, managed by Cliff Asness, holds the biggest position in Gilead Sciences, Inc. (NASDAQ:GILD). AQR Capital Management has a $629.8 million position in the stock, comprising 0.6% of its 13F portfolio. Coming in second is Jim Simons of Renaissance Technologies, with a $346.6 million position; 0.4% of its 13F portfolio is allocated to the company. Remaining peers that are bullish contain Ken Griffin’s Citadel Investment Group, Noam Gottesman’s GLG Partners and John W. Rogers’ Ariel Investments. Since Gilead Sciences, Inc. (NASDAQ:GILD) has witnessed falling interest from the smart money, we can see that there is a sect of hedgies who sold off their positions entirely by the end of the third quarter. At the top of the heap, Farallon Capital said goodbye to the biggest investment of all the hedgies watched by Insider Monkey, comprising an estimated $206.9 million in call options, and Jason Karp’s Tourbillon Capital Partners was right behind this move, as the fund sold off about $122.8 million worth. These bearish behaviors are intriguing to say the least, as total hedge fund interest was cut by 1 fund by the end of the third quarter. 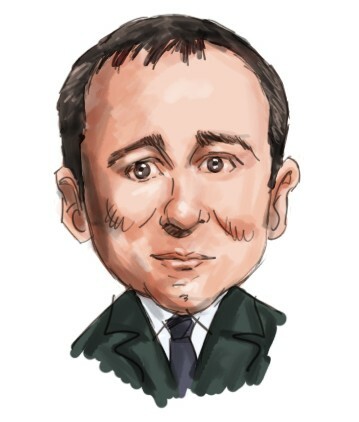 Let’s go over hedge fund activity in other stocks – not necessarily in the same industry as Gilead Sciences, Inc. (NASDAQ:GILD) but similarly valued. We will take a look at GlaxoSmithKline plc (NYSE:GSK), Lockheed Martin Corporation (NYSE:LMT), Thermo Fisher Scientific Inc. (NYSE:TMO), and General Electric Company (NYSE:GE). All of these stocks’ market caps are similar to GILD’s market cap. As you can see these stocks had an average of 41 hedge funds with bullish positions and the average amount invested in these stocks was $3.15 billion. That figure was $3.05 billion in GILD’s case. Thermo Fisher Scientific Inc. (NYSE:TMO) is the most popular stock in this table. On the other hand GlaxoSmithKline plc (NYSE:GSK) is the least popular one with only 24 bullish hedge fund positions. Gilead Sciences, Inc. (NASDAQ:GILD) is tied with TMO and also ranks very highly among billionaire investors. Considering that hedge funds are fond of this stock in relation to its market cap peers, it may be a good idea to analyze it in detail and potentially include it in your portfolio.